This Moroccan-inspired dish is delightful on a chilly fall evening — we saw our first snow of the season here today, so this was a perfect fit! As is usual with many Moroccan dishes, this has a fantastic blend of spices, together with fresh cilantro and parsley. This finishing touch of lemon adds a great brightness to the soup! I hope you’ll try this dish! 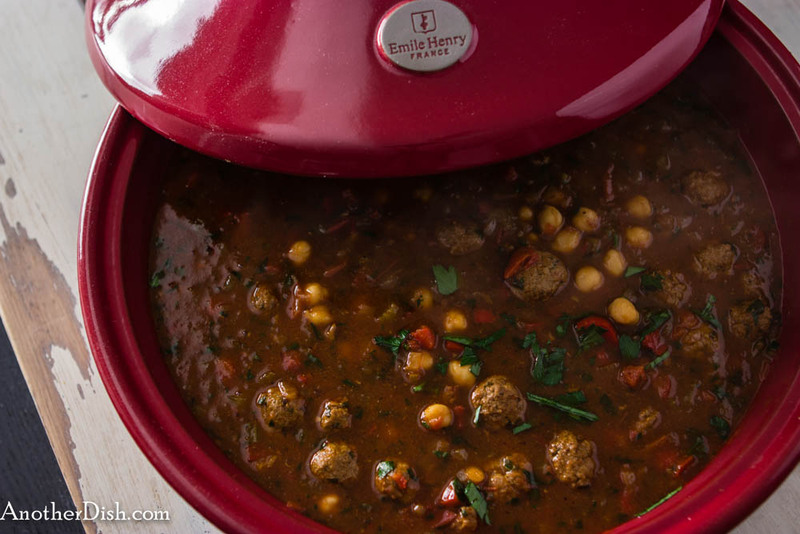 For the soup, heat the oil and butter in a flame-proof tagine or large Dutch oven over medium-high heat. Add the onions and saute until softened, about 5 minutes. Add the tomatoes, celery, red bell pepper, coriander, paprika, garamasala, salt and turmeric. Saute for 15 minutes, or until moisture has just about evaporated. Add meatballs to tomato mixture. Cook gently for another 10 minutes, being careful not to break up the meatballs. Add beef broth to meatball mixture. Turn heat to high, and bring to a boil. Reduce heat to low, and cook for another 15 minutes. Stir in the parsley, lemon juice and chick peas, and cook for another 2 minutes. Season with additional salt, if desired. Serve with fresh, crusty baguette. This entry was posted in Lamb, Main Dishes, Moroccan and tagged Cooking, Food, Food Photography, Foodie, Moroccan Food, Recipes on December 9, 2013 by AnotherDish.